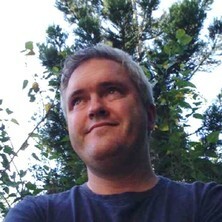 Kim Baber is a Fellow in Civil Engineering and Architecture at the University of Queensland and a practicing Architect. In 2015 he was awarded the Queensland ‘Emerging Architect’ Prize by the Australian Institute of Architects, and in 2016 Kim was awarded the Gottstein Trust Fellowship to research timber Architecture and fabrication technologies being developed in Europe and Japan. Kim is also a member of the UQ ‘Centre for Future Timber Structures’, and the Australian Research Council ‘Future Timber Hub’. Kim teaches and works on research projects with Architecture and Civil Engineering students where they design, develop and construct prototypes that test innovations in timber design. Kim is a researcher in the Future Timber Hub, currently involved in two research projects. The Future Timber Hub is an Industrial Transformation Research Hub to Transform Future Tall Timber Buildings in the Pacific region. The Hub aims to drive the future development of tall timber buildings in the Australian built environment. The aim of the Hub is to transform the timber construction industry in Australia by generating the skills, knowledge and resources that will overcome current technological and social barriers limiting the application of timber to tall structures. Kundoo, Anupama and Baber, Kim (2013) Light Matters. Sydney, Australian Design Centre. Baber, Kimberley Richard (2012). A tectonic dimension: studies of an architectural design methodology MPhil Thesis, School of Architecture, The University of Queensland.